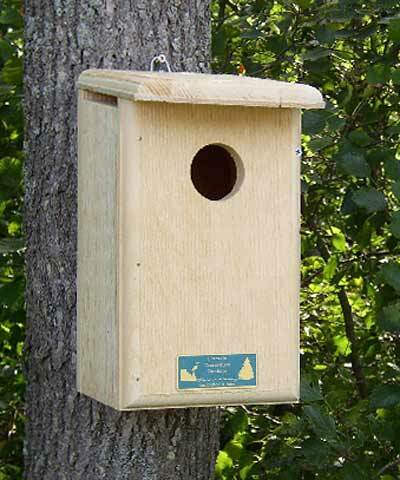 Small owls readily take to bird houses, so give them a home with the Coveside Conservation Products Saw-Whet, Screech Owl, and Kestrel House. Because of their smaller size, saw-whets, kestrels, and screech owls find themselves competing with other birds for nesting places. This house features drainage holes, a sloping roof, and ventilation slots for maximum comfort and cleanliness. When it's time to leave the house, fledglings have an easy time climbing out, as the interior of the house is rough and provides a grip. A bag of wood chips included with the house provides a soft pallet that prevents eggs from rolling around. For easy seasonal clean outs and quick observation, a latched panel at the side of the house tips up. Mount this house 15' high on a post or tree and stop the competition between small owls and other large birds. Made in the USA.